Fritz checks out the tally board at the Verona VFW on Election Night, as it shows Fritz winning all six districts in the Town of Verona in the Councilman race on November 3, 2009. Fritz is pictured here with his good friends (L-R), Mike Faraino (a drummer for FPB), Bob Zeller, and Nelson Dodge (Verona Town Justice), during Fritz's Election Night Party on November 3rd. Fritz with the two greatest sisters anyone could ask for, his sisters (L-R), Linda and Nancy, at his Election Night Party on November 3, 2009 at the Verona (NY) VFW. Fritz is pictured here at his Election Night Party with his good friend of many years, New York State Senator, Joe Griffo, at the Verona (NY) VFW. Fritz at his Election Night Party on November 3, 2009 with his good friends (L-R), Barb Allen, David Belvick and Steve Allen. 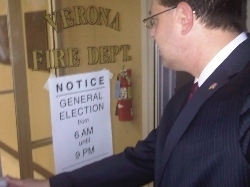 Fritz arrives at the Verona Fire Department (location Fritz votes at) early in the morning of November 3, 2009 to cast his first vote as a candidate. 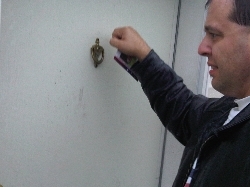 Fritz is shown here campaigning in the rain on October 31, 2009 in Verona, NY. Fritz looks on as (left to right) Steve Joanis and Steve & Barb Allen present a check for $1,000 to Linda Finnerty and Mary Raymond of the Town of Verona Food Pantry on October 30, 2009. Fritz first visited the Pantry and publicized its needs. 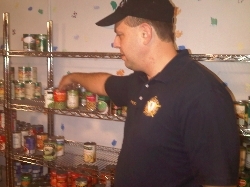 On September 24, 2009, Fritz toured the Town of Verona Food Pantry at the Verona United Methodist Church in Verona, NY, and met with staff regarding how it operates and the needs it has. Fritz celebrates his Primary Victory of September 15, 2009 with his friend of many years, Sean Fuller, at the Verona VFW. Fritz is pictured here during the Verona Firemen's Field Days Parade on June 6, 2009. Fritz gets ready to take part in his first parade as a non-musician, as he and his good friend of many years, Bob Zeller get ready for the Verona Firemen's Field Days Parade on June 6, 2009.